This was the main theme of the speakers at the public meeting organized by the Bhumi Adhikar Andolan (BAA), India’s land-rights organization, at the Constitution Club, Delhi. It was participation of activists, researchers and parliamentarians. The meeting was organized amidst the ongoing protests against forcible land acquisition in Gujarat and Maharashtra for Prime Minister Narendra Modi’s flagship bullet train project, even highlighting how the Feasibility Report of the Mumbai-Ahmadabad High Speed Rail (MAHSR), prepared by Japan International Cooperation Agency (JICA), has omitted four crucial chapters. A report released by National Alliance for People’s Movement (NAPM) at the meeting found that Chapter 12 to 15 went missing in the feasibility report. These chapters deal with crucial details on project costs, implementation plan, financing options, and economic and financial analysis. Named “Mumbai-Ahmedabad High Speed Rail (Bullet Train), A People’s Critique”, the report says that the government’s report did not illuminate any sustainability model and did not mention the costs and its financial burden upon the citizens. The bullet train project, which Modi mentioned as his dream project, has attracted criticism for not following the procedures stipulated in the Land Acquisition Act 2013, says the report, adding, the feasibility report surprisingly is using old data, collected in 2011. The report, citing a Right to Information Act (RTI) plea, points out how the concerned authorities simply cite the ‘secrecy’ clause of the RTI Act as the reason for not providing any information on the bullet train. The report further says that the bullet train project’s scheduled completion date has been fixed at August 15, 2023, though regretting, the due process such as social an environmental assessment has not been carried out, as mentioned in the Land Acquisition Act 2013. A number of projects, including expressways, industrial corridors, dedicated flight corridors, existing expansion of the railway line and now the Bullet Train planned to be setup in a short stretch of area, creating havoc to lives of the people. According to the report, the government estimates the bullet train would have 40,000 passengers in a year, a claim which government sources themselves debunk, citing the present-day passenger traffic data from the feasibility study. 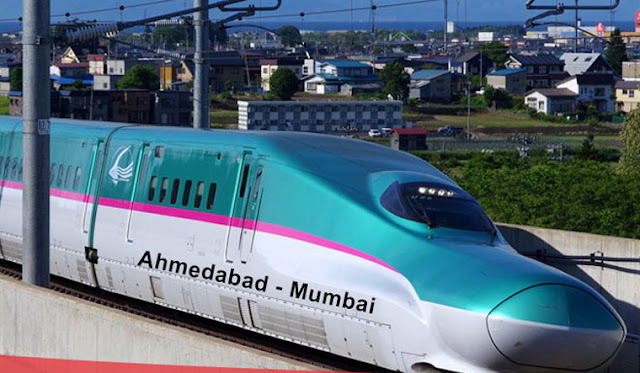 According to the report, the Mumbai-Ahmedabad route sees a footfall of 4,700 per day at the airports, and to assert that 98% of these would shift to Bullet Train, as estimated by Geeta Tiwari, a professor at the Delhi IIT, suggests that only those who have certain income they seem to opt for the high-speed train. Astonishingly, he said, the Ministry of Environment, Forests and Climate Change or any other department of the Government of India is not being involved in consultations around environment and social impact of the project. The consultations are being done primarily because the JICA funding guidelines require it. This is utter shame when our own laws are not applied and constantly violated. 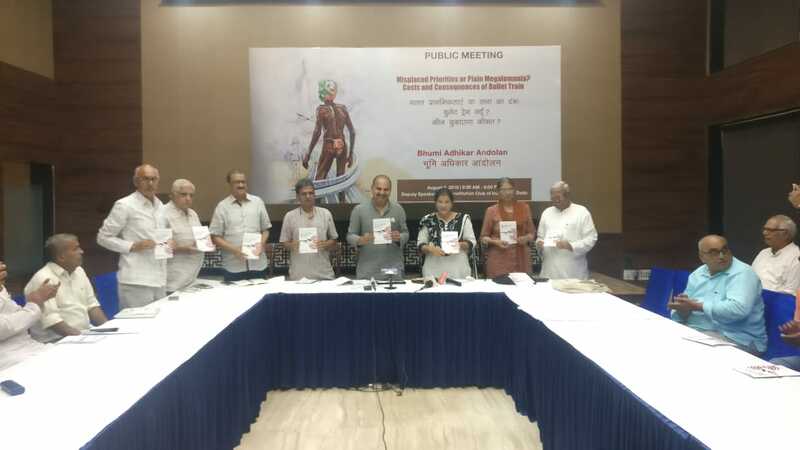 Among civil rights leaders who addressed the meet included Ulka Mahajan of the Sarvhara Jan Andolan, Krishnakant of the Paryavaran Suraksha Samiti, Jayesh Patel of the Khedut Samaj, Gujarat), Ashok Chowdhary of the All India Union of Forest Working People, Vijoo Krishnan of the All India Kisan Sabha, Anil Chaudhary of Insaaf, Ashok Shrimali of Mines Minerals and People, and others. 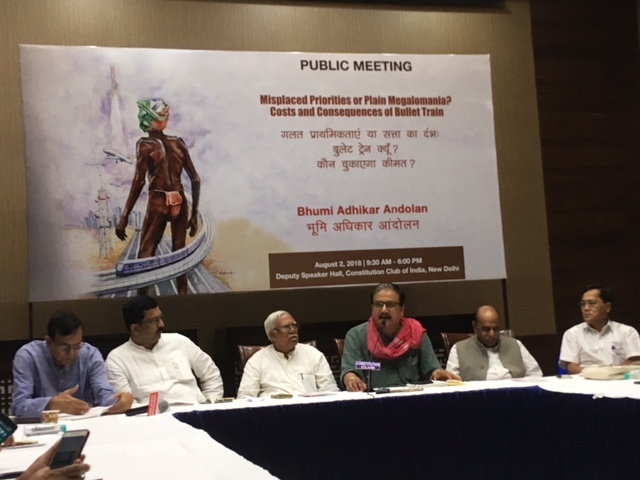 Politicians who addressed the meeting included Hannan Mollah, Mohammad Saleem, Jitendra Chaudhary of the CPI-M, Naseer Hussain of the Congress, DP Tripathy of the NCP, Manoj Jha of the RJD, D Raja of the CPI, and others. Is this development worth it?